Based on your experience, expectations, and needs you will likely have a unique opinion on rapid prototype manufacturing, different from everyone elses opinion, myself included. With that in mind, hereÂ is my perspective on rapid prototype manufacturing, with a focus on product strength. For me, it was always about getting sales, closing deals, making sure P.O.’s kept coming in. CNC MachiningÂ â€“ Each time I have worked with a CNC machined rapid prototype it has never failed me at a trade show or in a sales meeting. What I am mainly referring to is the strength that a CNC machined prototype delivers. How do you take a prototype to a trade show or to a meeting and not be afraid of the customer or buyer breaking it? A CNC machined rapid prototype isÂ a good strategy. Now, were some of the parts overbuilt on strength, only to be scaled back for production and cost concerns? Yes, but I didn’t care about that right now. Today I need to win over my potential client, so I can get in the pipeline. I will solve the challenges a pending P.O. presents later. Today I needed strength. 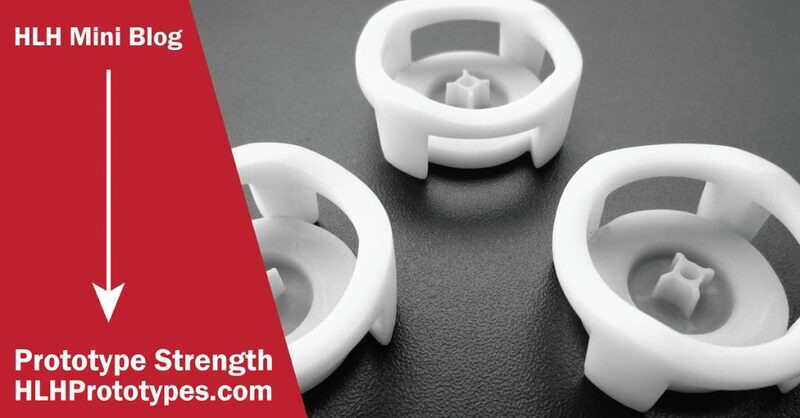 3D PrintingÂ â€“Â When 3D printing first came about (and over the years) we tried some rapid prototype samples at shows and in sales meetings, the prototype almost always broke. No matter how many times you expressly tell the customer or buyer that this is just a prototype, the reality is no one will respect your prototype the way you do. They want to test it right away, in the meeting, like it is a production unit. So your rapid prototype better be ready to handle the abuse. That said, 3D printing was great for us in many ways. It helped us more quickly get through the iteration process internally. As well as offering great trade show support by being able to quickly print additional samples to help a booth look fuller. There are many tremendous benefits to 3D printing, it is here to stay, and getting better every day. From my perspective though (depending on the product), it can fall short on strength. Vacuum CastingÂ â€“ IÂ always had a good experience with the strength that vacuum casting samples offered. It was also a great manufacturing technique to show off different surface textures and product colours at trade shows. Keep in mind that even when a buyer likes your product they will often say something like, “it would be better with this finish or that colour”. There will always be specific feature set requirements that they feel better matches their customer base needs. So I found it very useful to anticipate these questions and have samples on hand to answer them right away. I wouldn’t necessarily display these samples for everyone to see. Just have theÂ additional samples on hand that you can easily pull out, don’t giveÂ people a reason to say no. Rapid Tooling (Injection Molding)Â â€“ Always the best option if the budget allows. The rapid prototype you are presenting is, in fact, a finished product with the needed strength, desired surface finish, and desired colour. The added benefit was that if we had to make changes to the product (to secure a P.O.) we had not already eaten up our working capital on full production tooling. Did this mean that someÂ of our rapid tooling was never used again? Yes, but who cares, we got theÂ orderÂ and moved forward to full production, which is where profit lives. Over time we started to take a mix ofÂ CNC, 3D, Vacuum Casting and Injection Molded rapid prototypes to shows and sales meetings. This allowed us to deliver a complete picture of the product and ourselves. Remember that it is not just your product that is being evaluated by buyers/distributors, it is also your ability to quickly adjust your product based on feedback and your understanding of the manufacturing process that is also being judged. It may sound a bit more expensive to approach trade shows and meetings this way…but nowhere near as expensive as failing at a show or in a sales meeting because your rapid prototype was not strong enough. FreeQuote@HLHPrototypes.comÂ to talk to our project team today.